Sometimes, it’s difficult to find the right sentiment stamp in your stash isn’t it? Well, that’s when I head to the internet and search for a great quote. I wanted something to work with this cute little Greeting Farm image and thought this fit the bill. So it’s been computer generated and printed on the retired Stampin’ Up! Orchid Opulence. She’s been colored with Copics: BG10, E000, E00, E31, E37, E39, E41, E43, E49, E51, E53, E55, V01, V04, V06,and V09. And, she’s been paper pieced with a scrap of Basic Grey Wisteria from my scrap drawer. I wanted a different sort of shape for the focal point, so I used a flexible ruler to cut out a free form shape. And finally, I added a stamped strip of buttons from Technique Tuesday. 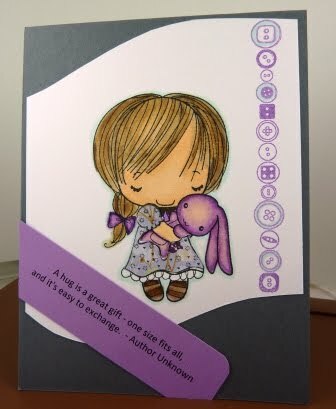 The card base is a standard A2 in Stampin’ Up! Basic Gray. Next Next post: Another two post day!